BIENCOURT DE POUTRINCOURT ET DE SAINT-JUST, JEAN DE, baron, governor of Méry-sur-Seine, lieutenant-governor of Acadia, commander of the first permanent settlement established in Acadia; b. 1557; d. 1615. Poutrincourt was the fourth son of Florimond de Biencourt and Jeanne de Salazar. There were nine children recorded of this marriage. The eldest son, Louis, a page of the King’s Bedchamber, disappeared in the battle of Dreux, 1562, fighting under the Guises. The second son, Charles, died while fighting in the Catholic advance at Moncontour in 1569. The third, Jacques, a page to Charles IX, inherited the title. A sister, Jeanne, was maid of honour to Mary Stuart. Jean was given the seigneury of Marsilly-sur-Seine in 1565 and was destined to inherit the seigneuries in Champagne, including the barony of Saint-Just, through his mother. On 14 Aug. 1590, a marriage contract was drawn up between Jean de Poutrincourt and Claude Pajot, the daughter of Isaac Pajot. Two sons were born to the couple, Charles and Jacques. Six daughters are also recorded. At an early age Jean de Poutrincourt entered the army in the service of the Duc d’Aumale and served with distinction in the siege of Paris against Henri IV. In 1593 Poutrincourt embraced the cause of the king after Henri’s conversion and reconciliation with the members of the Catholic League. Henri IV appointed him his “Gentleman of the Chamber” and Lescarbot tells us that the king once referred to him as one of the finest and most valorous men in his kingdom. Poutrincourt was appointed chevalier of the king’s order and governor of Méry-sur-Seine. Devoted to the monarchy and to the king himself, he amassed more honour than fortune, despite his many titles and his high position at court, having lost much of his wealth in the religious wars of France. 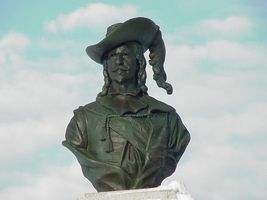 In the year 1603, Jean de Poutrincourt learned that his friend Du Gua de Monts had received a grant in New France and was planning an expedition there. The challenge of such an expedition appealed to Poutrincourt’s great love of adventure for he dreamed of founding a great agricultural colony in the New World. He was granted permission by Henri IV to accompany de Monts who was delighted to have Poutrincourt’s support which greatly eased the problem of obtaining volunteers for the expedition. It was Poutrincourt who obtained the necessary arms and soldiers for the defence of the settlement de Monts planned to establish in America. The expedition to Acadia, consisting of two ships, set sail on 7 March 1604, from Havre-de-Grâce (Le Havre). The voyage was long and filled with peril. Many times the captains of the two ships advised a return to France but both de Monts and Poutrincourt were determined to complete the journey. The coast of North America was finally reached and after months of hazardous explorations, de Monts decided to seek somewhere to winter the expedition. It was during this search that the vessels passed the place that was later to be named Port-Royal. This beautiful section of the country gave so much pleasure to Jean de Poutrincourt that he asked for and was given it as a grant by the Sieur de Monts on his promise to colonize the land. This grant, which included fur-trading privileges and fishing rights, was confirmed by the king on 25 Feb. 1606. De Monts and most members of the expedition decided to spend the winter on an island they named Île Sainte-Croix. Poutrincourt did not remain in North America, having been sent to France by de Monts that autumn with a rich cargo of furs. In the spring of 1606 Poutrincourt returned to Port-Royal (Annapolis Royal, N.S.) as lieutenant-governor of Acadia to take command of the settlement at Port-Royal and to continue exploration of the coast to the south of it with a view to establishing a new settlement. Poutrincourt brought with him a number of workmen, as well as Louis Hébert, Marc Lescarbot, and his own son Charles. Soon afterward Poutrincourt and Champlain explored the coast to Cape Cod and established friendly relations with Messamouet and Secoudon, but the idea of a second settlement was abandoned after a battle with some unfriendly Indians during this trip. Poutrincourt devoted all his energy to strengthening the settlement at Port-Royal. He erected a number of buildings, among them the first water-driven grist-mill in North America. Under his direction fields were prepared and crops planted; the early dream of an agricultural empire was always foremost in his thoughts. He organized the fur trade and his men made regular visits across the bay to the mouth of the Saint John River, the richest source of trading in Acadia. Jean de Poutrincourt made friends with the Indians who trusted him implicitly. His treatment of the natives was always fair and just; he counselled treating them without the barbarity and cruelty practised by the Spanish in the Indies. By their conduct in Acadia the French under Poutrincourt set a pattern of behaviour which was greatly to their credit. 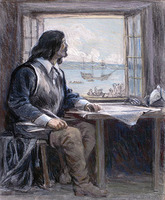 In the autumn of 1607, the ship Jonas returned to Acadia, with dispatches stating that the ten-year trading monopoly given de Monts’s company had been revoked by the king. The inhabitants of Port-Royal were forced to return to France. They took with them a cargo of cod and samples of wheat, corn, minerals, and Canada geese to prove the value of the settlement. Many things contributed to the failure of the colony at this time. The profits of the fish and fur trade had been less than expected owing to the large number of vessels poaching in the territory assigned to de Monts. Dutch vessels had also found their way to the St. Lawrence and carried off rich harvests of furs. The merchants who were financing de Monts found their profits on furs and fish being seriously cut by these intruders and were loath to put up more funds. Other Norman and Breton merchants and fishermen, exasperated at being excluded from trade in Canada, were complaining bitterly. The character of the recruits for the settlement had also contributed to some extent to the failure, many of the settlers having proven unfit for pioneer life. Another handicap in this period was the lack of interest in France in colonizing per se; some of the ladies at the French court were indeed interested in colonization, but rather as a means of evangelizing the Indians. The desirability of a permanent agricultural colony was thus obscured by the greater interest in trade or religion. Despite the setback, Jean de Poutrincourt still planned to settle Acadia. 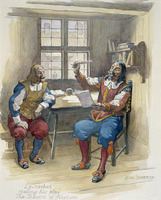 Lescarbot attributes the extension of de Monts’s monopoly for one year to Poutrincourt’s presentation of the “fruits of the earth” of Acadia to the king. It seems that Poutrincourt himself received, in about 1608, a commission from the king, the terms of which are unknown, although the grant of Port-Royal seems to have been confirmed. To draw the support of the court he emphasized the conversion of the Indians to the Roman Catholic faith. Poutrincourt was a good Catholic; he had tried in vain to induce priests to accompany the 1606 voyage and failing this in 1608 he wrote Pope Paul describing how on his previous trip to Port-Royal he had set Lescarbot to instructing the Indians. Lescarbot, to whom we owe much of our knowledge of the early years in Acadia, wrote, “at the request of our chief, M. de Poutrincourt, I devoted some hours each Sunday to the religious instruction of our men, both in order to improve their minds and to offer an example to the Indians of our manner of living.” Poutrincourt received the pope’s blessing for his projected third voyage to New France, and through the papal nuncio, Ubaldini, arranged that Father Fléché should accompany him. However, the Jesuits, who had influence with the king through his confessor, Father Coton, and with many of the ladies at court, were also interested in christianizing New France. The king therefore decided that Poutrincourt should take Jesuits with him on his return to Port-Royal. Father Coton chose fathers Biard and Massé for the mission and Father Biard repaired to Bordeaux where for a year he waited to sail. Poutrincourt did not return to Acadia until 1610. The delay was due in part to the death of his mother, the need to settle her estate, and trouble with financial backers, and in part to his disinclination to take the Jesuits with him. Biencourt shared the prejudice current in some circles at this time against Jesuit missionaries, whom rumour accused of being too interested in commercial profit. Poutrincourt finally sailed on 25 Feb. 1610 from Dieppe with Father Fléché, Claude and Charles de Saint-Étienne de La Tour, his own two sons, and Thomas Robin, Vicomte de Coulogne, who had invested heavily in the expedition. The two-month voyage to Acadia was broken by a mutiny of the crew, but Port-Royal was finally reached in May and found to be in good repair. The furniture was untouched and the buildings sound except for a partial falling-in of the roofs. Poutrincourt worked hard tilling the soil and with the aid of Father Fléché set about converting the Indians with a new zeal, wishing to prove to the French court that he did not need the Jesuits. The old chief Membertou was baptized along with all his family. 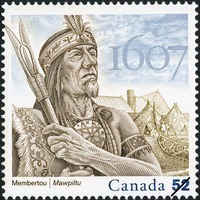 Twenty other natives followed Membertou’s example. Poutrincourt was so pleased with his success in this religious endeavour that he prepared an extract from the baptismal register to be carried to France in a ship returning with a cargo of furs under the charge of his son Charles. Young Biencourt sailed in July 1610 and while he was passing the Grand Banks a fisherman gave him the news that Henri IV had been assassinated. When Biencourt reached France he obtained an audience with the queen regent, Marie de Médicis, and presented her with the list of baptisms. The queen expressed her pleasure in the success of the missionary effort but any hopes the Biencourts had that the Crown could be dissuaded from sending Jesuits were soon dashed. The Jesuits had a powerful ally at court in the person of Antoinette de Pons, Marquise de Guercheville, the wife of Charles du Plessis, Duc de Liancourt and governor of Paris, who was herself the first lady-in-waiting to the queen. This deeply religious noblewoman fully supported the Jesuit desire to found American missions and she raised money at court so that fathers Biard and Massé could become partners with the Biencourts in the expedition after other backers withdrew [see Charles de Biencourt]. 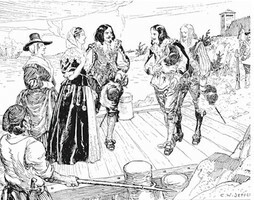 Young Biencourt set sail in the Grâce de Dieu on 26 Jan. 1611 with a group of colonists – including possibly Mme de Poutrincourt (Biard’s letter of 31 Jan. 1612) – the two fathers, and supplies for Port-Royal. The crossing took four months during which part of the provisions for the colony were consumed. On 22 May they were met at Port-Royal by a group of half-starved settlers. Poutrincourt immediately determined to sail across the Bay of Fundy (Baie Française) to visit his Etchemin friends and trade for food and furs. On his arrival the Indians entreated him to punish a French captain, trading illegally in the area, who had robbed them and killed a woman; they also advised him of the presence of three other French vessels, trading without the viceroy’s permission. On board one ship was Robert Gravé Du Pont who had escaped detention after committing an outrage on an Indian woman. This offence, if unpunished, could have endangered the trust and friendship Poutrincourt had worked carefully to foster. Father Biard’s intervention on young Gravé’s behalf occasioned the first clash between Biard and Poutrincourt. The viceroy pardoned the young man, but the interference of the priest in civil affairs annoyed him. Soon afterwards Poutrincourt sailed for France to exchange the furs collected for trade goods, leaving Port-Royal under the charge of his son, who had received the post of vice-admiral in the seas of New France. Poutrincourt arrived in France in August 1611. He talked to Mme de Guercheville who was still interested in the colony. Unable to raise money for his people elsewhere, desperate with worry over his son and companions at Port-Royal, and at the end of his financial resources, Poutrincourt was again forced to accept the help of Mme de Guercheville (Huguet, Poutrincourt, 364–65). He was able to outfit one small boat with provisions for Port-Royal; this arrived 23 Jan. 1612 carrying Poutrincourt’s agent, Simon Imbert-Sandrier, and Mme de Guercheville’s agent, the Jesuit Gilbert Du Thet. The arrival of Imbert and Du Thet only exacerbated the unhappy situation at Port-Royal and mutual accusations of disloyalty and incompetence were soon received in Paris from Biencourt and Biard. However the struggle between the Biencourts and the Jesuits and their allies was unequal, as Huguet comments; Poutrincourt was soon discredited at court. While still desperately trying to raise money, Poutrincourt was approached by the courtier René Le Coq de La Saussaye in August 1612 with a financial proposition which would eliminate his problem. Believing La Saussaye to be acting for the Jesuits, Poutrincourt accepted the proposal and as a consequence entered into an agreement whereby he borrowed money to pay his share toward outfitting a ship and sending La Saussaye to Port-Royal with supplies. In a letter written later to Lescarbot, Poutrincourt explained that La Saussaye had withdrawn at the last moment and claimed the arrangement made with La Saussaye was a trick to ruin and discredit him. Unable to settle his debts he was thrown into prison. On his release, ill and discouraged, he arranged a legal separation from his wife to make it possible for her to keep any money and property she still owned. In the meantime, Mme de Guercheville had bought Du Gua de Monts’s lands in New France: the title of viceroy of Canada was bestowed on Henri de Bourbon, Prince de Condé. In 1613 the dauntless Poutrincourt was able to form a partnership with several ship outfitters of La Rochelle, including Georges and Macain, by promising them a share of the fur trade in the Port-Royal region, which he still controlled, and on 31 Dec. 1613 he again set sail for Port-Royal. He arrived 27 March 1614 to find the fort in ruins and the inhabitants starving, after Capt. Argall’s raid the previous November. Records show that one mill and some barns had escaped destruction as had most of the planted fields but these were insufficient for the continuance of the colony at that time. Poutrincourt had no choice but to return to France with most of the colonists. He was also able to take back enough furs to more than cover the cost of the trip. 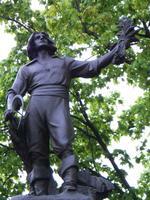 Poutrincourt deeded to his son the title of all his lands in the New World and Biencourt remained in Acadia. It is ironic that Poutrincourt who loved peace and wished to devote his life to agricultural development should die a violent death, having been summoned at the moment of fresh troubles in France and ordered by his queen to recapture Méry-sur-Seine in Champagne. Pierced by many bullets, he died in December 1615 at the age of 58. Various historians have given different versions of his death but the most accepted is that Poutrincourt died in an effort to forestall his commander-in-chief from receiving the surrender of Méry-sur-Seine, of which Poutrincourt was governor. Poutrincourt felt that he alone should capture it. He met his death at the hands of his own party. With him was his son Jacques who was taken prisoner. Jean de Poutrincourt has been described by contemporary historians as a man of great energy and enterprise. During his sojourn in Acadia he endeavoured, with his musical ability, scholarship, and sensitive taste, to foster in the little colony for which he was responsible a love of the finer things in life. Poutrincourt gave ten years of his life in a struggle to build for France a new agricultural empire. His efforts to make this dream come true impoverished his family and brought the disgrace of a prison term on his honoured name. If the affairs of France had progressed differently it would seem that Poutrincourt might have achieved for Acadia what Champlain was later able to do for Quebec. Poutrincourt was buried at Champagne where a large monument was erected to his memory. AN, H, no.1964. Champlain, Works (Biggar). Factum (1614). JR (Thwaites); Biard’s Relation of 1616 is in III and IV. Lescarbot, History (Grant). Mémoires des commissaires, I, 140, 145; and Memorials of the English and French commissaries, I, 197, 201. Purchas, Pilgrimes (1905–7), XIX, 213–16. Biggar, Early trading companies, esp. 261–70 and 292–94, containing an assessment of the relative objectivity of the primary sources. Lucien Campeau, “Autour de la Relation du P. Pierre Biard,” RHAF, VI (1952–53), 517–35. Charlevoix, History (Shea), I, III. Huguet, Poutrincourt, a thoroughly documented biography. Parkman, Pioneers of France (25th ed.). B. Sulte, “Poutrincourt en Acadie 1604–1623,” RSCT, II (1884), sect.i, 31–50, one of the first studies of Biencourt, containing, however, a number of errors. in collaboration with Huia Ryder, “BIENCOURT DE POUTRINCOURT ET DE SAINT-JUST, JEAN DE,” in Dictionary of Canadian Biography, vol. 1, University of Toronto/Université Laval, 2003–, accessed April 24, 2019, http://www.biographi.ca/en/bio/biencourt_de_poutrincourt_et_de_saint_just_jean_de_1E.html.